The year would be an odyssey. As the days passed, Richard Quinney kept a close watch-keeping a journal and taking photographs of the passing seasons on his family farm in Walworth County, Wisconsin. During the year the author, recently retired from a lifetime of university teaching, was being treated for chronic lymphocytic leukemia, and by year's end was moving from one place to another. The farm of the author's birth and growing up years was settled by his great-grandparents emigrating from Ireland during the famine. It is the place always returned to in times of need and solace. It would be easy to know the farm more in the past tense than in the present. To think of it, as Shakespeare wrote in his sonnet, as the place "where late the sweet birds sang." Although there were the strong and constant reminders of the past-from the rot and rust of decaying buildings to the aging artifacts found in drawers and trunks-one is transported by the wonders of the present in this much-loved place. 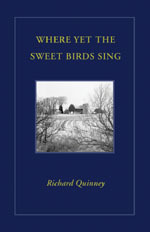 Where Yet the Sweet Birds Sing is a chronicle in the tradition of the nature essay and the spiritual journey.